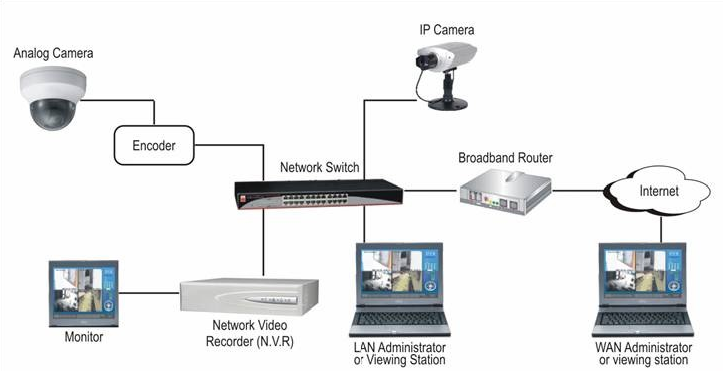 IP CCTV systems are based on using digital IP based Megapixel Cameras and a Network Video Recorder (NVR) or Video Management System (VMS). – Store as many recordings, from as many cameras as you want. You’re only limited by the size of the data storage on your NVR, computer or server. – Image quality is superior and doesn’t degrade over multiple copies or time, and it’s cheap to copy data to CDs to pass information around. – Digital NVR’s or VMS’s record up to 30 images per second, and can record simultaneously from each camera. – It’s easy to sort through recorded data, and you can even connect to the digital CCTV system over the internet to view live images or to review previous recordings.